Hi, everyone! 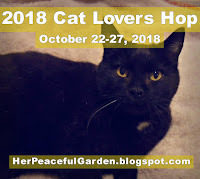 This is the sixth post of my blog blast of cat-themed projects for the Cat Lovers Hop! A special thank you to Janis at Her Peaceful Garden for hosting this wonderful event to celebrate our love of kitties! The hop runs until tomorrow so there is still time for you to join in the fun! I'm excited to be joining this hop for the fourth year! For an update on my husband's health, please see my first post here. 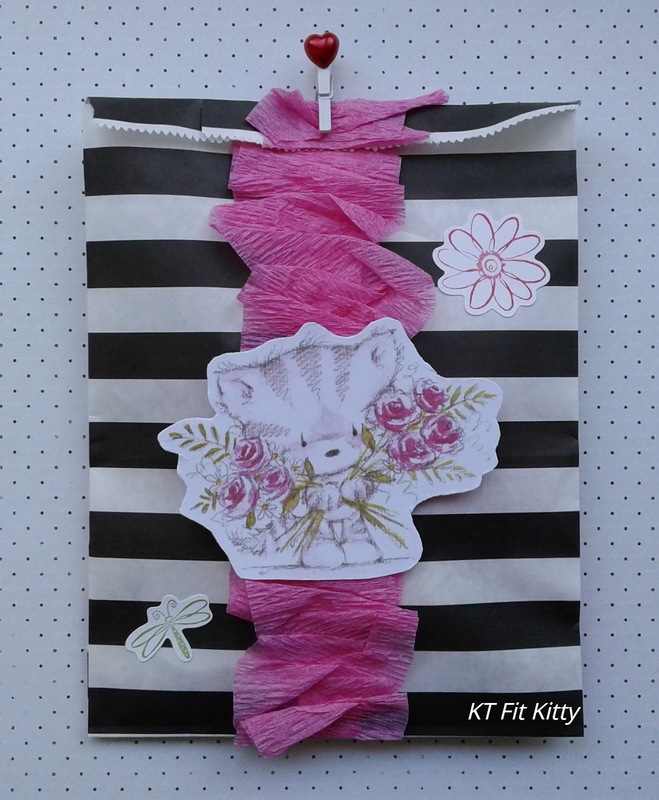 Last spring I was involved in a cat-themed swap, and part of the swap was to make some pretty packaging. This is a gift bag that I decorated to hold some swap items. The precious cat image was fussy-cut from a topper from Wild Rose Studio Printed Panels - Elsie (I received these in some happy mail many years ago - thank you - you know who you are!). I made a gathered crepe paper strip and adhered it to a gift bag (Dollarama). I finished it off with a tiny heart-topped clothespin and some fun stickers. That crepe paper makes a perfect background for the sweet Wild Rose topper and looks so chic against the b&w stripes! Smiles! Love that tiny clothespin. I need to look in my dollar store more closely. One of my very fave color combos ... bold B&W stripes with a bold pink!! The kitty image is really gorgeous. Awww!!! I'm a big fan of stripes! I love your choice of colors! This is one of my fav envelopes made by you! This looks great and love the colors. This one is very striking! The pink against the black and white pops! Love the pink crepe paper! This is gorgeous and I love that ruffled crepe paper and the little clothespin closure! So creative. What a wonderful way to package your treat. Very pretty. I like the gathered crepe paper. Cute image and I like the black and white paired with the pink, classy and elegant! Love the details and colours in this project. Kitty, you have such a knack for making use of the most interesting little items in new and super-creative ways. This is so pretty with the gathered crepe paper against the bold B/W bag. Sweet kittycat, too!